We’ve been here long enough that our clothes are wearing out. We allowed ourselves one suitcase apiece, brought only our favorite clothes, and we packed for all four seasons. But summer ended about a week after we arrived, and the chilly autumn and moderate winter have led us all to return to the same long-sleeved shirts, jeans and socks again and again. We don’t appear to be doing anything beyond sitting, standing, and walking, yet somehow the frequent wear has caused many articles to fall apart at the seams. The girls bring me their ripped coat linings, ask me to sew up the holes in the knees of their leggings. 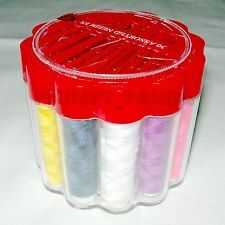 The sewing kit with a dozen small spools of thread and 20 needles, all the same size, has seen plenty of action in this household since I bought it at Kaiser’s in September. My pajama pants ripped at the seam when I knelt down to put out the chocolates and cookies from Nikolaus, and though I sewed up the ragged ends, the split soon returned. I miss my sewing machine that would make light work of these patchings, but doing it by hand makes me feel useful and I do have the time. The needles are so tiny that I have to wear my drugstore eyeglasses to thread them. I was on my way to needing glasses in St. Paul but hadn’t stopped to do anything about it; now I wear them nightly and am grateful for the assistance. I didn’t think that we would get older here; I wanted to believe that this year was “time out of time,” that the pause button had been pressed on our lives, to be resumed when we returned. But I find this is not so. It’s as real as time spent anywhere else. What if I die here, I thought, a week into our stay. Over time the one thing that would be remembered about me would be that I died in Berlin, and that struck me as so wrong, that this place that was not yet a part of me should serve as a foothold for others to believe they knew something about me. It felt entirely incongruous. But I knew, as you must, when you live long enough, that people do not choose the location of their end, and though you might spend 95 percent of your lifetime in one town, you could die on a road trip to Chicago. Or a simple drive to pick up your daughter from a college visit. It’s not up to you. Others have died since we left Minnesota. A friend our age lost her father this fall, a wisp of a man who sat near his wife on the couch in St. Paul when we met him, so clearly in love with the woman beside him, relishing in retirement, full of ideas and curiosity and presence. A friend my parents’ age lost her son this week to a stroke or heart attack, alone in his apartment. She was the one who, by chance, was in Chicago when my mother-in-law died, who came, with my father, to the impromptu memorial. She knew, somehow, the right things to say, the right way to be, and I was startled and grateful to see her in this light, the clarity that comes in grief. The other day I threw my pajamas and favorite socks into the kitchen trash on top of unwanted leftovers from the fridge. They were not salvageable, in spite of my efforts with needle and thread. It was an unceremonious end to beloved items, remnants of home. But being clothes, their demise freed me to buy replacements, and purchases require train trips and chilly walks and odd, mangled conversations, and I went out into the cold Berlin air with euros in my pocket and eagerness in my step. This entry was posted in Sabbatical and tagged aging, Berlin Germany, death, passage of time, sewing, St. Paul Minnesota on January 24, 2014 by Jill M.. I am basking in the perfection of this paragraph. “basking in the perfection of this paragraph” — this comment makes me so happy. thank you. I am glad you are leading real lives in Berlin and are not on hold!! We are indeed, and I am so grateful that you are a part of our real lives here!